The unspoilt valley is lush gren and has much vegetation, some of the land is being cultivated to produce fresh fruit and vegetable to feed the hungry travellers that are desperate to get away from the hustle and bustle of the nearby tourist areas. Many of those chosing to stay on the island are backpackers, who bring tents or stay in the tree houses provided. In addition to the clouds of butterflies fluttering by, there are also two small waterfalls to discover, providing a refreshingly cool shower after a hike through the secret valley. There is also a small white pebbled beach on which to relax and paddle in the crystal clear Mediterranean waters. 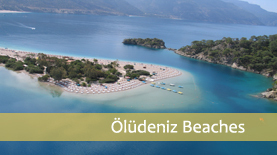 Many of the boat trips that leave daily from Oludeniz beach make a stop at Butterfly Valley. Visitors are asked to refrain from shouting whilst exploring as the butterflies are very sensitive. Also to preserve the valley by taking your litter away after your visit. In an area so loved by tourists and the Turkish people themselves, it is a rare treat to find a village so completely untouched and unaltered by man. Faralya delights all those who do venture a visit. A small, quiet village set on the steep hillside just 8km from Olu Deniz, 1200 feet above sea level, Faralya is an ideal day out for adventurous travelers, or an authentic Turkish hide out for those who want to stay longer. Because Faralya has retained its Turkish village status, there is relatively little to do in the village it self (just a few small hotels and cafes), but it is an ideal starting point for many nature based activities, including a starting point for the famous Lycian Trail. 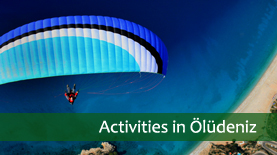 Faralya can be easily reached by dolmus (public minibus) from Olu Deniz, or by taxi. Those who like a bit more of a challenge can reach Faralya by way of an uphill hike from Butterfly valley, which can itself only be reached by boat (or down hill from Faralya!). Be warned, this is by no means easy ground, and it is not recommended for the faint hearted. The breathtaking views and warm hospitality of the people of Faralya however, can be appreciated by everyone.